How can I ensure that a CE (CPE) certificate is available for printing after a student completes the course? Drake Software is proud to be a qualified sponsor of continuing education with the National Registry of CPE Sponsors (NASBA), the California Tax Education Council (CTEC), the Oregon State Board of Tax Practitioners, the Texas State Board of Public Accountancy and the Internal Revenue Service.Drake offers CPE credits for a variety of education courses. *Important Message for Registered Tax Return Preparers (RTRPs):‐ 01/23/2013 The IRS continuing education and testing requirements for Registered Tax Return Preparers (RTRPs) are subject to a permanent injunction effective January 18, 2013, per a federal district court ruling. In accordance with this order, continuing education is not currently mandatory for tax return preparers who have the Registered Tax Return Preparer designation or who were planning to obtain this designation. Thus, the option to proceed with registering or participating in a CE program is now voluntary. The ruling does not apply to CPAs, Enrolled Agents and tax attorneys, who were exempt from the RTRP regime as they are already regulated under Circular 230 requirements. Drake issues a completion certificate based on the student's professional designations. Certificates are issued for IRS, NASBA, CTEC, TX and PA. If a CRTP in CA, be sure to enter your CTEC number to receive a certificate that provides both IRS and CTEC credentials. Oregon now accepts NASBA certificates in place of Oregon self-study certificates. Certificates are available for printing after course completion. On DrakeETC, the kind of certificate depends on how the student's account, or the Webinar registration, was set up. On DrakeCPE, the student will be able to select the certificate to print from a drop list. The email address associated with your DrakeETC account is used for attendance verification during the webinar. Using different addresses to sign up for different webinars will delay the processing of your CPE certificates. If the email address for your Drake ETC account is not unique, you will be prompted to enter a new email address during the webinar registration process. The address entered is saved as the email address for your account. A unique email address is required per attendee when registering for a webinar. CPE credit is issued only for a live webinar, not for the recorded version. Pay to Register – No charge to print your CPE certificate after the webinar. Free to Register/Pay for CPE – Pay only if you want to print a CPE certificate after the webinar. Webinar certificate requirement – During the webinar, participants are polled with questions. Participants must respond to at least 75% of the questions as a condition to receiving CPE credit after completing the webinar. 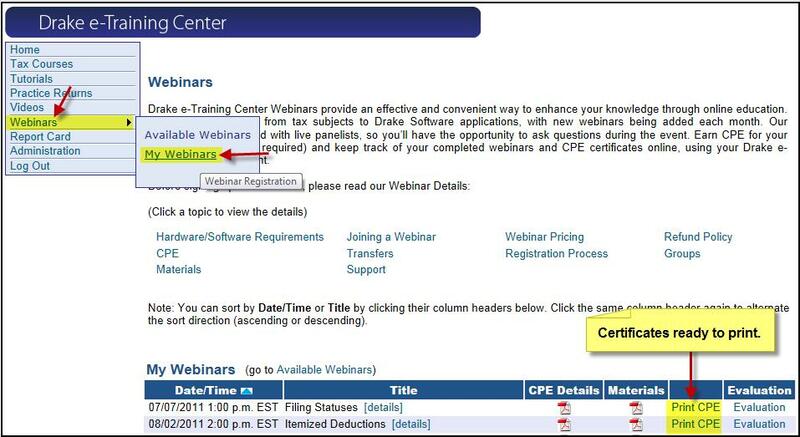 CPE certificates are posted on DrakeETC.com for attendees approximately 48 hours after the event. You will receive a follow-up email after the event with detailed instructions. To print the certificate, go to your ETC account (enter your ETC User ID and Password, not your EFIN and Drake password): You must click Print CPE (when the link is available) to create your certificate and record CPE credits earned. DrakeCPE allows the student to select which certificate(s) they would like to print once the evaluation for the course is completed. For CTEC credit, be sure to enter the CTEC# during account setup. No entries are required for Texas, Oregon, or Pennsylvania during account setup. (DrakeETC) the student's account must have been set up to indicate that CPE credit is desired (by the selection of Yes for CPE Credits). pass course with an 80% or better. The California Tax Education Council (CTEC) establishes professional tax education standards for California and bases CPE credit on a 50-minute hour. Student must pass course with an 80% or better. (DrakeETC) Student account must indicate that CPE credit is desired by selecting Yes for CPE Credits. A valid CTEC # must be entered for the student account. The Oregon State Board of Tax Practitioners and the Texas State Board of Accountancy base CPE credit on a 50-minute hour. (DrakeETC) The Oregon Preparer or Texas Preparer check box must be selected for the student account. The Pennsylvania Board of Accountancy bases CPE credit on a 100-minute hour. (DrakeETC) The Pennsylvania Preparer check box must be selected for the student account.